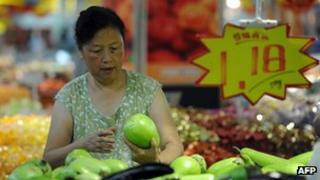 China's inflation rate hit a 10-month high in February, as Lunar New Year festivities drove up food prices. Consumer prices rose 3.2% from a year earlier, with food prices up by 6%. Inflation has been a hot political issue in China. There have been concerns that if consumer prices rise too much, it may prompt Beijing to tighten monetary policies, which in turn may hurt China's growth. However, analysts said the latest data was unlikely to prompt any such moves. They argued that the price growth was driven mainly by the Lunar New Year celebrations, which are traditionally associated with an increase in consumer spending. "We expect limited market and policy impact as investors and officials understand the Lunar New Year distortions quite well," Bank of America Merrill Lynch analysts said in a note after the data was released over the weekend. "Though policymakers should be wary of inflation later this year with economic growth recovery, it's too early to call for significant monetary tightening at present," they said. After years of experiencing a blistering pace of growth, China has seen its economic expansion slow in recent times. In 2012, the country grew at a pace of 7.8%, its weakest performance in 13 years. Prompted by slowing growth, China has taken various steps over the past few months to spur a fresh wave of economic growth. It cut interest rates twice last year, to bring down the cost of borrowing for consumers and businesses. It also lowered the amount of money that banks need to keep in reserves in an attempt to boost lending in the country. On the investment front, Beijing approved infrastructure projects worth more than $150bn (£94bn). Some analysts said that if China continued to pursue easy monetary policies, consumer prices could rise further in the latter half of the year. "If monetary policy remains at the current loose stance, consumer price index in 2013 will likely be much higher than the 3.5% target set in the National People's Congress," said Zhang Zhiwei, an economist with Nomura. China set a 3.5% inflation rate target for the current year at the National People's Congress, its annual parliamentary session, last week. However, in his final appearance at the congress, outgoing Premier Wen Jiabao warned that keeping prices in check would remain a key challenge for the policymakers. "There are relatively big inflationary pressures this year, mainly because there are pressures on China's land, labour, agricultural products and services," he said. "And major countries are stepping up loose monetary policy, so we can't overlook imported inflationary pressures."